The stone barrier which we call Hadrian's Wall was built by the Roman legions following a visit by the Emperor Hadrian to Britain's northern frontier region in AD 122. It was a huge engineering feat, a continuous stone (originally part turf) barrier extending about 80 Roman miles (73 US miles) from the Lower Tyne on the east coast of northern England to Bowness-on-Solway in the west. As originally planned it included small forts (milecastles) every Roman mile along its entire length with two turrets, or towers, at intervals of one-third of a mile between the milecastles. A defensive ditch was dug in front of the Wall for its entire length except where it ran along the crags or cliffs in the central sector. During construction the plan was changed to incorporate a series of large forts along the line of the Wall to accommodate a garrison of many thousands of auxiliary soldiers and cavalry. This turned the Wall into a launching platform for military operations beyond the barrier. These forts were mostly built to the normal ‘playing card' pattern (i.e. of rectangular shape with rounded corners) with a standardized layout for the internal buildings. In addition to the barrack blocks, these included the headquarters building (principia), the commanding officer's house (praetorium), the granaries (horrea, often two in number), and sometimes a hospital (valetudinarium). The garrisons of these forts usually comprised 500 or 1,000 men and were sometimes infantry, sometimes cavalry, and sometimes a mixture of both. 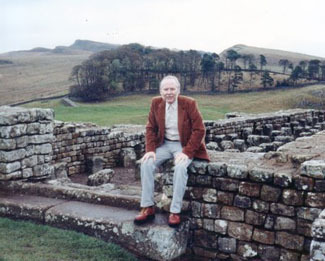 The photograph shows me sitting on what remains of the west wall of the north granary in the fort at Housesteads (Vercovicium) in the central sector of the Wall; my feet are resting on the threshold of the large doorway which gave access to the building. Housesteads is regarded as one of the classic forts of the Roman Empire, thanks in the main to the exemplary excavations conducted by R. C. Bosanquet at the end of the 19th century. Hadrian's Wall remained in use for a remarkably long period of time (almost 300 years) and over the centuries many changes were made to its structure and its garrison. Its gradual abandonment only took place in the first half of the 5th century after the Emperor Honorius (AD 393-423) had written to the British provincials to inform them that he could no longer defend their island from barbarian aggressors. Sestertius of Hadrian AD 122. This lovely Hadrian Sestertius " Exerc Britannicus" AD137 showing Hadrian addressing troops in Britain is David's choice of coin in this context - shown courtesy of the British Museum in London.